The most extreme tour of the year has returned with its most devastating line-up yet. 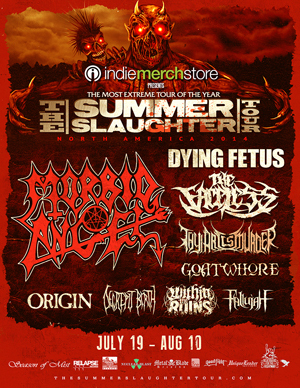 The 8th annual Summer Slaughter Tour, presented by IndieMerchStore.com, runs from July 17th through August 10th. It features such heavyweights as MORBID ANGEL, DYING FETUS, THE FACELESS, THY ART IS MURDER, GOATWHORE, ORIGIN, DECREPIT BIRTH, WITHIN THE RUINS and FALLUJAH. The tour will stop at The House of Blues in Los Angeles on July 19th and Irving Plaza in New York on August 8th with VIP ticketing currently available now for both shows. Look for the complete list of tour dates to be announced in the coming weeks. David Vincent (vocals/bass) of MORBID ANGEL states: "Summer Slaughter will be the ultimate, extreme music festival this year and we look forward to headlining this special touring event. It will be great to see our long-time fans and also to expose a new generation to MORBID ANGEL."